Since becoming a parent, I’ve read a lot of parenting books. When the babies are little, the books are filled with lots of fluff and sweet talk. They also like to give you lots of advice without backing it up with any real facts or science. During the newborn phases, most parents probably don’t even notice that. For one, we are assuming that these books are based on some sort of evidence, but it’s just watered down for our mushy new-parent sleep-deprived brains. But I like facts. I like to know where information comes from. This is why I absolutely loved NurtureShock . I spent almost two years lying down with Annika for most of her naps and about 80 percent of her bedtimes. During that time, I read a lot of parenting books. Somewhere in there, my brain regained about 80 percent of its functionality and I realized something. Most parenting books are filled with information that’s based on what people know about adults, not children. That’s one of the many reasons why I loved NurtureShock . Not just because it’s filled with easily digestible science and research, but because it doesn’t assume that we already know how children work. 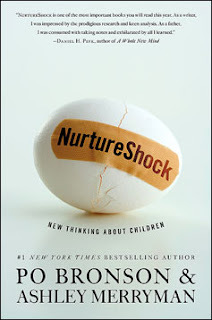 NurtureShock is filled with information gleaned from research studies that DISproves a lot of the common societal beliefs that we’ve been spoon-fed by pediatricians and “parenting experts” for the past several generations. For one thing, the authors Po Bronson and Ashley Merryman are not pediatricians. They don’t have agendas, other than as information seekers. And secondly, the information in this book is about researching what we thought we knew about parenting to see if it is accurate. The finding are truly shocking. White parents’ refusal to talk about race PROMOTES racism. Teenagers are not naturally lazy and cranky. Their bodies really do function differently than adults’. Kids lie because we send them the message that it’s okay. Young children shouldn’t be judged on i.q. tests because their brains aren’t done forming yet. Programs designed to teach children life skills can be detrimental. Violence and aggression are sometimes caused by the television shows children watch, but the study results were surprised by which shows caused aggression. Language skills develop based on a specific parental reaction. These aren’t the only things you will learn in NurtureShock. It is a solid 240 pages filled with evidence and findings relating to common parenting advice and why a lot of it is wrong. The book also has another 94 pages of notes, acknowledgments, and references if you are interested in reading more. NutureShock is also a great read because the book’s authors chose to focus on what works for the masses. This book isn’t promoting pie-in-the-sky hopes and dreams about making your child the best and the brightest. Instead, it is a book chock-filled with information for parents on how our children work, mentally and emotionally. With this kind of information, it is bound to help parents be more effective at relating to their children. ← Moving into a new realm as a blogger, RUDE comments! Hi Martha! I am not far into this book, but am now inspired to get at it! In the interim, would you mind sharing what types of tv shows are more likely to cause aggression? I've just started putting Kai in his high-chair in front of a Baby Einstein video for the sheer necessity of being able to cook our meals without him crying and hanging on my legs the whole time. The refrigerator magnets and music & lights activity table in the kitchen are no longer holding his interest. I've heard not so great things about Baby Einstein videos, but they give me a good 20 min to cook & clean-up, which is huge for me to finally have this kind of short-term distraction that keeps him engaged & peaceful for a bit. I'm not interested in getting him to watch a lot of tv at all, in fact, I'd prefer he watched none, but I'm finding that I have to make some concessions in this area since I just really need him to be happily occupied a couple times a day while I am in the kitchen. I don't have a learning tower yet, either, but maybe one day I will, finances permitting. Also, what do you think about DVDs like Planet Earth for a toddler? The book doesn't give very many specific examples. But the shows they found to trigger relational aggression were certain educational shows, typically on PBS. The shows they found to be problematic were "lesson" shows. Ones that showed children being mean to each other for most of the show and then end with a resolution. But they found that the poor behavior was what the kids remembered, instead of the lesson. I really liked these videos. They are super simple. They aren't TV shows. They are simply done. And they aren't overly commercial. We never used the Baby Einstein videos. I don't know that those are necessarily bad. I just think that people were angry to find out that they weren't actually making their children smarter like they marketed them. Right now Annika is super duper into Sesame Street. I really like SS for a variety of reasons, but I've also found very little relational aggression. Kai is probably a little young for SS, but not for long. I plan to attempt to spawn next year. I think I need this book. Margaret, yes, if you don't read any other parenting book, you should read this one. Of course, the other ones have their place. I recommend starting before you have children. It takes time to develop a parenting philosophy and the further ahead of the game, the better prepared you will be. Connie, you should definitely read it. I can try to answer all your questions, but the book will do a much better job. Of course, I always love your e-mails, soooo, ask away!